Perhaps she really believes what she wrote, perhaps she received some directive to write it as one more anti-vitamin C hit piece, or perhaps she was just regurgitating in her own words someone else's opinion piece. However, any of those scenarios are sad. If she actually thinks her article is truthful, she should strongly consider never writing another "science" article again, as the evidence discounting her anti-vitamin C arguments is enormous, and it is woefully apparent that she made no serious attempt to properly research the issue. It would only take a few seconds on PubMed or the Google search engine to quickly realize that the use of vitamin C as an antiviral agent is not some fringe, unscientifically-based therapeutic approach. 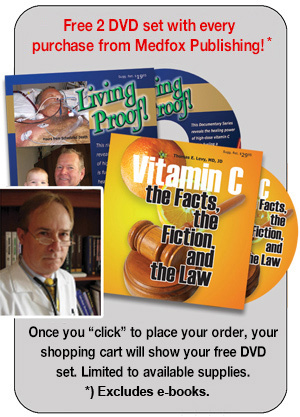 In this article, I will endeavor to give an overview of some of the most pertinent research documenting its enormous value as an antiviral agent, and a sampling of much of this research will be cited at the end of this article for the motivated reader seeking their own scientific substantiation on the benefits of properly-dosed vitamin C.
"Properly-dosed" is certainly the most important consideration in achieving a pronounced antiviral effect from vitamin C ingestion. There is no question that if someone with the common cold or influenza takes one pill or capsule of the typical formulations found in most supplemental vitamin C preparations, it is likely that there will be no discernible positive effect. A prescription blood pressure drug will not significantly impact high blood pressure if 5% or less of the recommended dose is taken, and the same goes for vitamin C in treating any acute viral infection. Much of the scientific literature on vitamin C "concludes" that it has no positive impact on a certain infection or medical condition even though the given studies used very tiny doses. All infections produce increased oxidative stress where the pathogens proliferate and where their toxic metabolic byproducts are disseminated. This increased oxidative stress accounts for nearly all of the morbidity and symptoms associated with a given infection. Also, when infections are overwhelming, some of their negative impact results from the physical mass or presence of the infection directly impairing normal biomolecules from properly interacting with one another. And when significant infections have been present long enough, they cause a severe body-wide depletion of vitamin C, effectively resulting in an acutely-induced state of scurvy. Just as classical scurvy is associated with severe infection, severe infection results in a state of scurvy. This very fact makes it apparent that taking sizeable doses of vitamin C with any infection is more than appropriate to help restore the stores than have been depleted. Also, vitamin C is absolutely essential for supporting, strengthening, and optimizing immune system strength. In both the test tube and in the human body, vitamin C has been clearly documented to kill/inactivate viruses. In fact, there has been no virus treated in the test tube (and there have been very many) that has not been stopped cold by vitamin C.
Dr. Frederick Klenner, well over 50 years ago, cured a wide variety of acute viral syndromes still considered by "modern" medicine to be incurable, including polio and measles. However, he used multi-gram doses of vitamin C and administered those doses parenterally via intramuscular and/or intravenous routes. 57 of 60 polio cases were cured by Dr. Klenner in only three days. The three other cases needed two additional days of vitamin C to be completely cured. Dr. Klenner never gave an infant of the tiniest body size a dose of vitamin C as low as the ridiculous NIH-recommended daily amounts of 75 to 90 mg. A 200-pound adult male with a new onset cold or influenza might need 50 to 200 grams of vitamin C daily by various routes of administration to stop it in its tracks. Getting 75 to 90 mg of vitamin C to cure an adult of a viral infection is as likely as that same male becoming inebriated on a single sip of beer. Ms. Dador's article also includes the other standard vitamin C "talking points," presumably in an effort to make the public scared of vitamin C or to just be dubious of its ability to cure infections. She asserts that taking "high doses" of vitamin C can cause other "health problems," including an increased risk of kidney stones. In fact, research done at Harvard showed just the opposite. Individuals who took regular multi-gram doses of vitamin C not only did not develop stones, they were statistically less likely to develop them. Other studies confirmed this conclusion, and at least one study even showed that multi-gram doses of vitamin C were able to help dissolve pre-existing kidney stones. For people who already have varying degrees of kidney disease/failure, vitamin C, and any other medicine or agent, needs to be given with increased supervision. However, when given with due oversight and caution, vitamin C has the ability to positively impact kidney disease as well. And add to this the simple fact that it is well-established that individuals with highest blood levels of vitamin C simply live the longest (lower all-cause mortality). Ms. Dador also mentions the "upset stomach and painful cramps" that can result from taking in excess of 2,000 mg of vitamin C. There are many forms of vitamin C other than ascorbic acid that do not upset even the most delicate of stomachs. Regarding the possibility of cramps, vitamin C in very high doses (usually much higher than 2,000 mg), pulls water into the colon and results in a brisk, but self-limited, "C-flush." While this might surprise some who supplement and were not already aware of that possibility, it is an excellent way to reboot a gut filled with putrefaction and toxins resulting from poor digestion. It really depends on how you want to view something: "painful cramps" or a quick flushing and cleansing of the colon? Ms. Dador also notes that enough vitamin C can be obtained in a variety of foods. This, again, is simply not true. A healthy diet is better than a lousy diet, to be sure, but it can never give you all the vitamin C you need, especially if you have an infection or are already sick. Man, along the with primates, fruit bats, and guinea pigs, lost the gene that encodes the fourth enzyme in the liver needed to convert glucose to vitamin C internally. All of the other animals make their own vitamin C, and pretty much live healthy until they die. Not so with human beings. Domesticated pets make a minimal amount of vitamin C, and they often get the same diseases as humans when the infection/disease challenge is great enough. This means that most humans share the same compromised health due to their genetic deficiency of internally-produced vitamin C, and only those humans that supplement properly can hope to live a reasonably long life that is largely free of a reliance on prescription medicines. And as if Ms. Dador's article was not misleading enough, she ends it with the advice to just stop wishing for the impossible (that is, something that can really help your cold), and take your analgesic pharmaceutical drugs: ibuprofen and acetaminophen. Both of these drugs are toxic, especially the acetaminophen, which has been damaging livers permanently for many decades now. Vitamin C has never damaged a liver, or just about anything else in the body, for that matter. Articles like the one Ms. Dador has written continue to pop up with an aggravating regularity, but the internet and many information-rich websites have now prevented the pharmaceutical companies and the mainstream medicine zealots from hiding the truth about how to stay healthy, and also how not to spend much money in doing it. Just remember that if something doesn't really make sense to you, you should follow where your brain is taking you. Never assume that your doctors know everything, especially when it is your health on the line. Dr. Levy regularly contributes brief articles of interest to the NaturalHealth365 website, which can accessed here: www.naturalhealth365.com.